Consider the following reparametrization of $\mathbb R^3$: $$(x,y,z)\mapsto (x-\cos z,y-\sin z,z).$$ Note that the horizontal translations of your helix go to the vertical lines. So the pullback of the canonical metric on $\mathbb R^3$ is the metric you want. I'm pretty sure that Nil geometry works, but I don't know a reference. 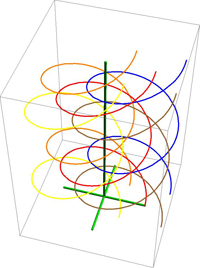 I seem to remember that one may think of Nil geometry as fibering over the plane, and that geodesics connecting different points in the same fiber had projections to circles. I think then these give helices. A more general criterion was given by Dennis Sullivan for when a foliation may be realized as the geodesics of a Riemannian metric. Not the answer you're looking for? Browse other questions tagged euclidean-geometry dg.differential-geometry mg.metric-geometry or ask your own question. Aren't Riemannian geodesics also geodesics of the associated Cartan geometry?